Lakeside Toys were the manufacturers of the original rubber and wire Gumby and Pokey bendys. They also produced a variety of Mini-Flex and Super-Flex bendys like The Green Hornet, Smokey the Bear and Raggedy Ann. 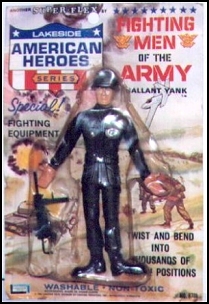 IN 1966, Lakeside released the American Heroes series, rubber figures with wire structures, primarily featured characters from the old west. Many of the figures had holes in their hands to hold their weapons, which are virtually impossible to find unless you buy the figures still on their original cards. The three main sets in the series were Tex Starr (Tex and Jenny Starr, Indian and Horses), Fighting Men of the West (Pony Soldier, The Westerner and horse) and Fighting Men of the Army (Gallant Yank). There was also a Lone Ranger, Tonto and horses that were simlar to, but not part of the American Heroes series. If you dig obscure and undervalued toys from the '60s then these Super-Flex figures are for you. You can still find carded figures, even the harder to find pieces like Jenny Starr or the horses, for under $20.